Today's first catch-up picture is this bright little Crimson Flower Study. 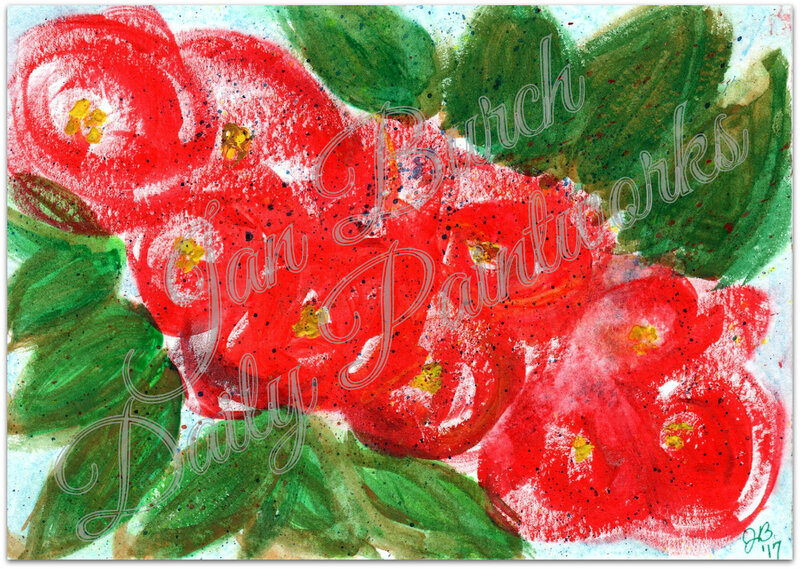 For more information and to purchase this original artwork, see it HERE at my DPW gallery. The second catch-up picture is called Splash Study. It's a personal favorite, because it was a total, spontaneous experiment and I just like the way it turned out! 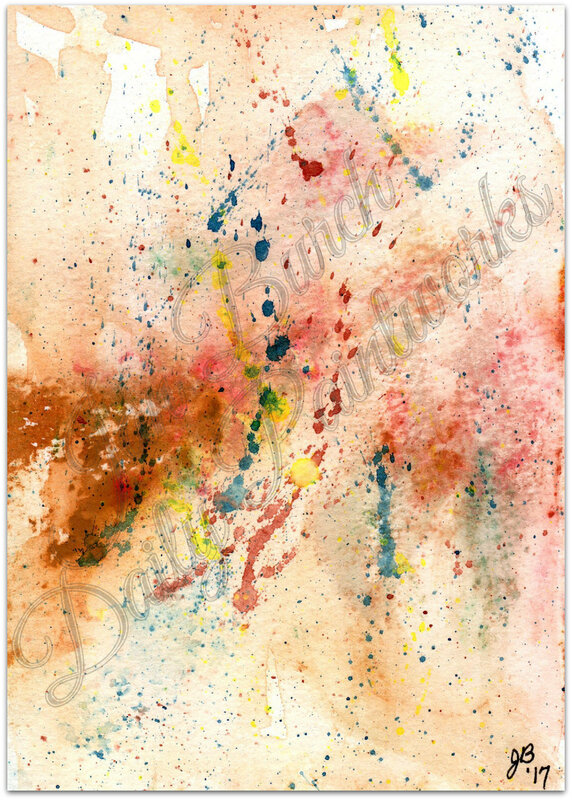 For more information and to purchase this original artwork, see it HERE at my DPW gallery. Both paintings are 5x7" and were done in watercolor on 140-lb cold-pressed paper. Each painting is signed, titled, and dated on the back. To see all of my art pieces for sale, visit my my DPW Gallery on the Daily Paintworks site. "Splash Study in Red, Yellow, and Black"
This painting was done in watercolor on 140-lb cold-pressed paper. It measures 7 inches high by 5 inches wide, and can be displayed horizontally or vertically in any orientation. It is signed, titled, and dated on the back. A simple study in watercolor to create the impression of a waterfall - this time in shades of gray. The small leaf floating on the current adds a touch of color and whimsy, and was drawn with gel pens. The painting measures 7 inches high by 5 inches wide, and is signed, titled, and dated on the back. It was inspired by and entered into The Gray Challenge at Daily Paintworks. It measures 8 by 10 inches in gallery-wrapped canvas. The mixed media elements used include acrylics, tissue paper collage, gel pens, and permanent markers. The back is signed, dated, and titled by the artist. Back to painting & mixed media after a break, I've created this lovely 10x10 stretched canvas as a ode to my favorite season! A quartet of four stately trees, each with their foliage ablaze in the oranges, yellows, and deep greens of summer-into-fall, stand in a dreamy, fantasy park-like setting. Metallic colors on the tree trunks and background provide a luminous glow. A little bit abstract, a little bit primitive, and lot of impressionism went into the spontaneous style of this original art piece, perfect for those who love the autumn season! For more details and to purchase this original artwork, see the product page HERE at my Zibbet store. 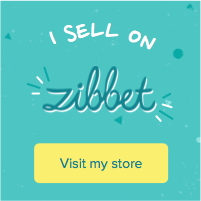 Or, check out all of my Fine Art Originals for sale on Zibbet. This might be a great way to pick up an affordable gift for the art lover on your list! See the auction info and bidding page HERE. After an unwanted but unavoidable hiatus (due to life, jury duty, and a sick kitty), I'm back to finishing the products for Round 2 of my Patreon project! The theme for Round 2 is "protection and wisdom" and the colors are blue and purple. Want to see more? 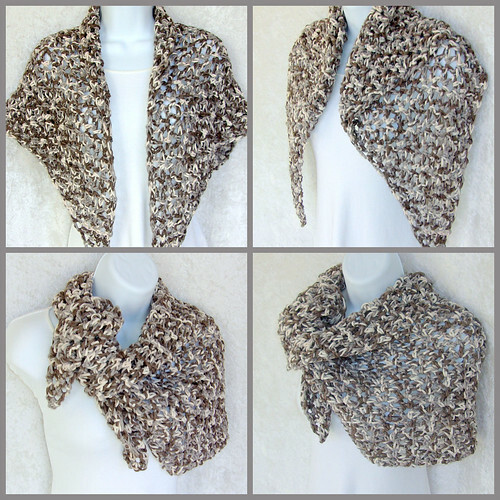 If all goes well, I should have the shawl to reveal in a few days. But at that point ... only Patrons will get to see it in real time! The reveal will be done in a Patron-only post, and it will make the shawl available for a Patron to purchase (if they want) at least 24 hours before it's announced to the general public. 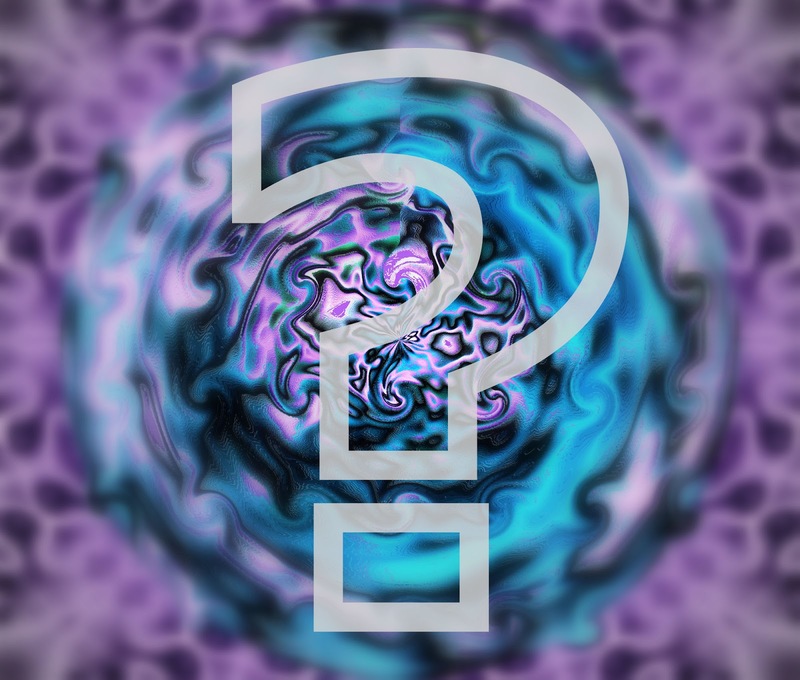 Patreon Round 2 - blue/purple jewelry reveal coming soon! I've been up to my elbows in blue and purple beads! Over the past several days I've made close to a dozen jewelry pieces in my Round 2 colors. This has given me plenty of time to ponder the qualities of these colors - and my Patrons can read all about it in this post which I just shared with them. Now, about those jewelry items: Several pieces sold before I could get them listed in my Zibbet shop, which is not a bad thing :) But don't worry, I have more in the making and listing, including a uniquely designed set of four bracelets that can joined together and worn as a long and beautiful necklace. This means a reveal is coming soon, so please stay tuned! PS: If you become a Patron at $3 or more per month, you can read that Patrons-only post and all the others, too! Please consider becoming a Patron, to support the arts and help me spread more colorful healing in the world! Wow, you aren't kidding about healing with color. I just looked at the picture, and I instantly felt a sense of relief! This astute reader gets it: The colors in the referenced photo (see link) are predominantly blues, purples, and some greens. These hues are all on the "cool" side of spectrum, which is known to be calming and soothing - especially in the quiet shades that I picked for the photo. For our purposes, though, we can go ahead and assume that we - our bodies, including mind and spirit - vibrate. So does everything around us, including the colors we surround ourselves with. And vibrations align with what's near them - it's called resonance. It was noted over 350 years ago that movements of clock pendulums, hanging near each other on the same wall, will eventually come into alignment - or, resonance. That little observation has intrigued scientists ever since, and we're finally getting some answers on it! Now, because we resonate with our surroundings, we can consciously bring into our field certain vibrations that evoke qualities we want. Just like the pendulum clocks - well, ok, that's an over-simplification but it still works as a metaphor - we will begin to resonate with the healing vibration we've evoked. That, in a nutshell, is the basis of all vibrational healing, and it works with qualities as varied as sound, minerals, Chinese or Ayurvedic elements, herbs, flower essences, and ... color. Even in the world of physics, color vibrates - it has a wavelength and everything. As an element of vibrational healing, color offers qualities that soothe, energize, regenerate, and more. Color healing also delves into associations with other levels of our energy fields, ie. elements in Chinese medicine or depths in Jin Shin Jyutsu. 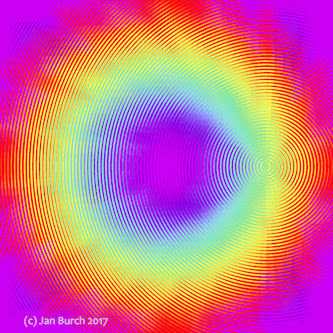 And, it's easy to surround yourself with a chosen color: You can wear it, put it on your wall,or even set it in your computer's screen saver! That, my friends, is a very brief look at how and why healing with color works! The next question is, why do I choose the colors I do for the qualities I want to evoke - such as Round 2's blue and purple for Protection and Wisdom. Well, that's a question for a future post - which will be visible to Patrons only. If you're reading this and you're not a Patron - yet- why not make a pledge so you can follow along with us on the journey! Please consider becoming a Patron, to support the arts and help me spread more colorful healing in the world! A compact bouquet of autumn foliage, accented with sparkling blossoms, fills this sturdy, shiny little vase! This original artwork adds a cheery note to your decor. 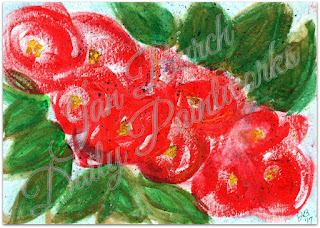 Painted in acrylics with mixed media - including glittered appliques for the accent flowers - on gessoed, acid-free 90lb mixed media paper. Titled, signed, and dated by the artist on the reverse side, this original work of art makes a wonderful addition to your art collection. Interlude before the reveal - with a gift from Nature! It's coming! I have finished the Heart of Love & Compassion canvas, and it's gorgeous. I'm just now processing the finished photos of this new art piece and getting ready to list it. Within 24 hours, we'll have another reveal for my wonderful Patrons only! The canvas completes my Patreon project's Round 1, focusing on the energies of love and compassion through heart-based colors of pink and green. I'm moving already to Round 2 - Protection and Wisdom, which are illustrated with blue and purple. PS: If you'd like to be in on the coming and future reveal posts, please consider joining as a Patron! I share my newest Patreon products in Patron-only posts at least 24 hours before I promote the product to the general public. 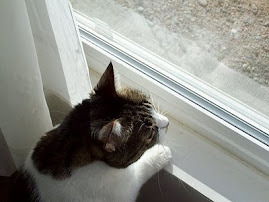 You can see it when it's fresh for as little as $3/month - and your support makes it possible for me and LuvLee the cat to keep our home - which is sincerely appreciated. 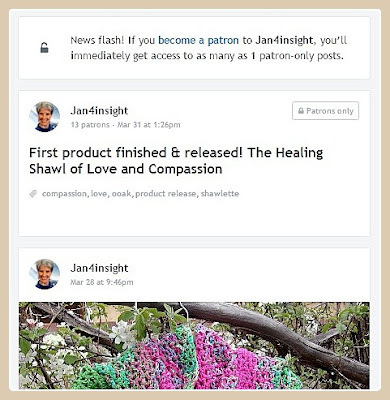 Heart of Love & Compassion: Pre-Reveal & getting back on track! Pre-Reveal! Here's a preview of the art canvas that's my current work-in-progress, called The Heart of Love and Compassion. "The Heart of Love and Compassion"
Actually, that's just a corner of what will be the final product in the first round of my Patreon products, focusing on the colors of the Heart Chakra - green and pink - and the qualities of Love & Compassion. My Patrons will be the first to know when this gorgeous art piece becomes available in my Zibbet shop. It shouldn't be too much longer - hopefully by the end of the coming week! Then I'll move on to my second round of Patreon products. Round 2 will focus on the colors turquoise blue and purple, which represent the qualities of Protection and Wisdom. I'll be making a jewelry set for this round, along with the shawl and art canvas. Preview photos coming in a week or so! > If you're not a Patron yet, please consider joining us, so you can follow the progress and get notified for the advance releases! Your pledge of $3, $5, or $10 a month (or more) helps me & LuvLee the cat stay secure in our home - and that is so appreciated!